SepFluor Limited (“SepFluor”) was founded in 2004 to explore for, mine and beneficiate fluorspar in South Africa. Construction of SepFluor’s current primary project, the R1.7 billion Nokeng open pit mine and concentrator is now complete. Nokeng comprises three adjacent, high-quality haematite-fluorspar deposits. 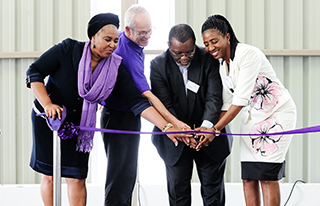 On 23 August 2018, SepFluor officially opened the Dr Lelau Mohuba Training Centre situated at Nokeng Fluorspar Mine. Mining Review-- South African fluorspar junior SepFluor is moving swiftly towards the start of operations at its first project, Nokeng in South Africa. Modern Mining-- In our regular top mining projects feature we look at projects distinguished by their size, innovation or pioneering spirit. This year we have selected five that meet these criteria, four of them in South Africa and one in Ghana. The commodities covered are diamonds, zinc, fluorspar and gold. Modern Mining-- Patience and perseverance are paying off for South Africa based fluorspar explorer and developer SepFluor as its R1,7 billion Nokeng opencast mine north of Pretoria nears completion. Not only is the current fluorspar price well in excess of the company’s initial budgets but the first year of production from the mine has already been sold, as Paul Crankshaw reports in this article. Read more.